These Are Some Cutie Kids! Our twin grandchildren just turned two a couple of weeks ago. Their birthday came while I was still traveling to the strange planet for 12 hours daily, which did not lend itself too well to shopping and shipping. My dear spouse is very handy and helpful but was at a complete loss about what to do, so the twins had only a card from us on their big day. Fortunately,I have now found the perfect gift and I’m pretty sure they will agree that it was worth the wait. One of my friends mentioned some really cute handmade dolls she had found on Etsy, so I checked them out. What I found turned out to be the perfect gift for our grandtwins. In fact, these dolls are the perfect gift for kids of any age, adults, collectors, anyone really. They are truly adorable. So cute and so very well made. 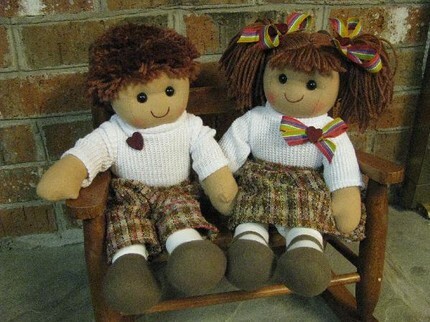 A boy and girl doll are included in each order. A great match for our grandtwins because they also came in a boy and a girl set. You can find these adorable dolls at CutieKidsDolls.etsy.com. Each pair comes with an official Cutie Kids Club membership certificate. They come in matching and removable outfits that coordinate beautifully with the different hair colors that are available. I had a hard time choosing but finally decided on the Bandstand Kids because their hair color is dark brown like our little twins. I think we’ll be back in good graces with the kids in just a few days! My goodness, those are adorable!